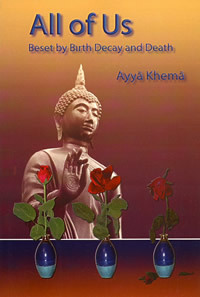 This booklet, containing transcriptions of twelve talks by the renowned Buddhist nun Ayya Khema, is for all people everywhere who seek liberation from suffering and desire true happiness. The Buddha taught: "thereís only one thing I teach: suffering and its end." Suffering is not only pain and grief, but all the unsatisfactoriness all of us experience during our lifetime. It is that unfulfilled striving in heart and mind which keeps pushing us in so many directions to find the ultimate satisfaction. When we have realized that all the avenues we have tried have brought us to a dead end, then the time has come to turn to Buddhaís teachings and see for ourselves whether his promise of an end to suffering can be experienced within ourselves and whether true fulfillment is possible.